New book, 80 pages, SS10247. 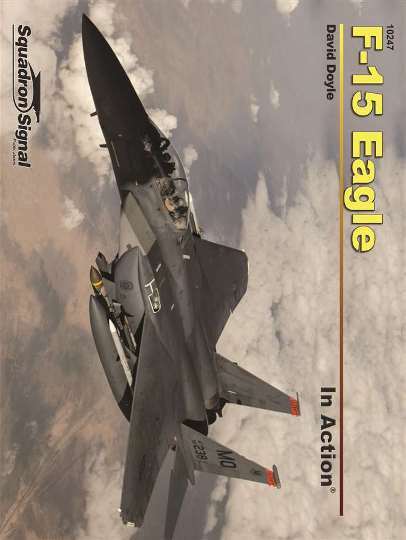 First flying in 1972, the McDonnell Douglas F-15 Eagle has transitioned from a true air superiority fighter into an all weather strike aircraft. Thus far, the aircraft has compiled one of the most enviable records of a post-Vietnam fighter, logging over 100 victories and no losses in air to air combat. The bulk of the fighter aircraft operated by the USAF in Vietnam had been conceived during the Cold War as interceptors against nuclear-armed Soviet bombers. This strategy involved high altitude, high speed, air to air missile armament, and a long range. Utilizing these aircraft in Vietnam, with visual engagement rules, pointed to the shortcomings of the planning. Though both the F-105 and F-4 were deployed to Vietnam, neither were truly optimized for the role that they were forced into. Further shortcomings of the then-current fighter strategy was revealed in July 1967 when the Soviet's unveiled the MiG-25 Foxbat. The Foxbat was a twin tail, twin engine fighter aircraft capable of Mach 2.8. The US Air Force responded with renewed interest in what was then known as the F-X program. This program had begun as an effort to develop a multirole aircraft with variable geometry wings. After briefly considering a lightweight, single engine fighter, a concept discarded in light of the shortcomings of the F-104, Project Definition Phase (PDP) contracts were issued to Fairchild-Republic, McDonnell Douglas, and North American Rockwell on December 30, 1968. After considering the proposals advanced by all three firms, a design and development contract was issued to McDonnell Douglas for the aircraft that would be designated F-15. Illustrated with over 170 color and B/W photos, 5 color profiles, line drawings and data table. This item was added to our catalog on Monday 15 April, 2019.